IMCDb.org: Opel Blitz in "Die Geschichte der Deutschen Eisenbahn, 2000"
In the centre of pic. You managed to pick the difficult one! I think it is a wartime Opel Blitz, but that is a bit vague. 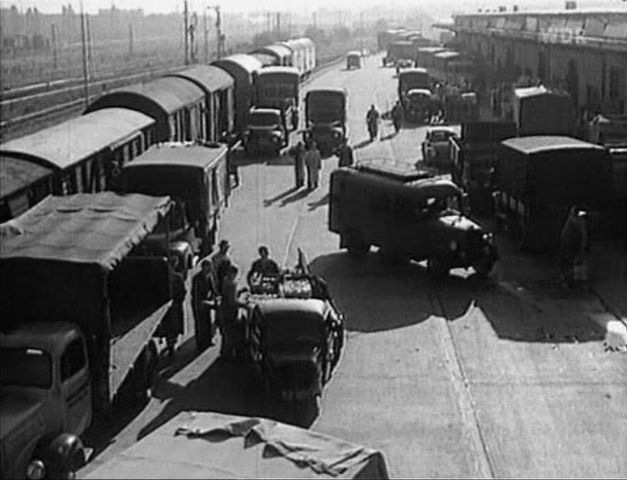 On the left we see (probably) a Mercedes-Benz L311, behind it an Opel Blitz 1,75t, and two more further back. On the right the trucks are too blurred, but then comes a Volkswagen 'Käfer' and what looks like a Tempo Matador. Centre front the Goliath, which is listed elsewhere. The picture was originally made for the Goliath, but later I've found another one. The other vehicles are unfortunately not better visible. We could use 'Opel Blitz', as it is at least possible. With three newer Opel Blitz standing around this is not too bad. There is also such possibility - this page for the Goliath and the another /vehicle_130667-Goliath-GD-750-1949.html for Matador. But maybe indeed will be better to list this as Opel.